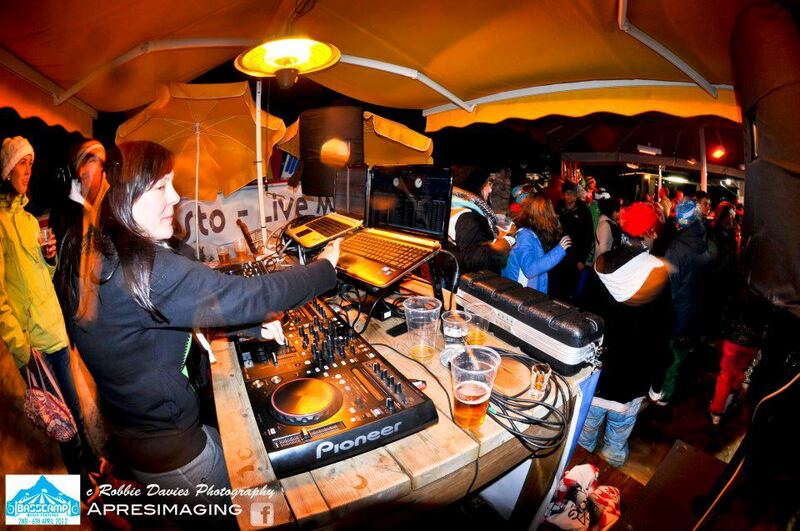 Not so long ago i visited Morzine to see my most excellent Dj girlfirend ‘C:SHE’ and shred at Morzine-Avoriaz. I was also invited to spin some tunes at The Basscamp Music Festival Apres event at the base of the Pleney Bubble lift. I didn’t really know what to expect, but was literally blown away, not only by the resort and it’s facilities, but by the energy and personality of the crew behind the Basscamp movement. Literally 200 ravers rocked out in their ski gear as the sun went down to cutting-edge breaks, ragga DnB and booty-electro. I had to mentally psyke myself to step-up to the 1’s and 2’s as the crowd bobbed with intrigue and I took control of the decks. It was one of the biggest crowds i’d played to in ages and it was a buzz to take them on a journey through disco, booty house and breaks. Seriously good times! I then took it on as my duty to share the love and invite DJ C:She to spin up a storm in Chamonix. 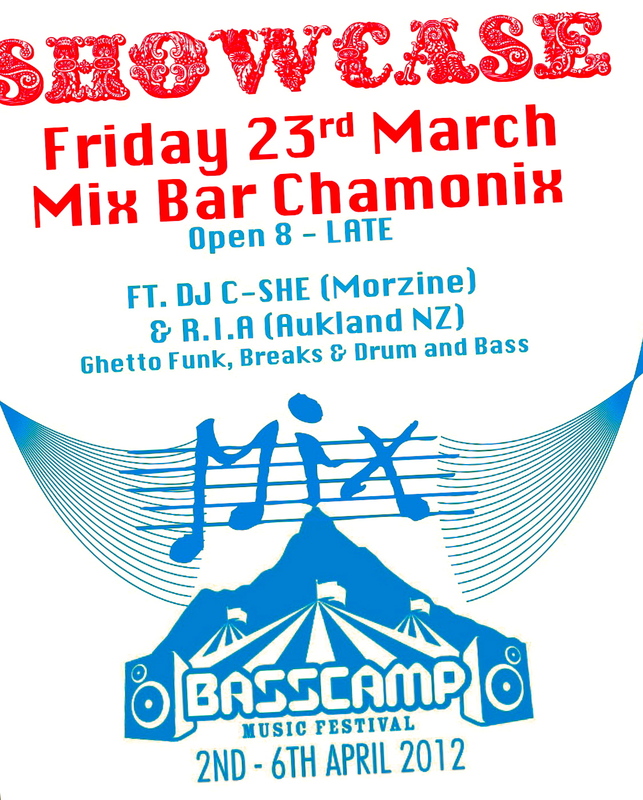 Party people it’s time to experience a small taste of what the Basscamp Music festival rocking Morzine 2-6th of April is all about! Basscamp Music Festival boasts some of the best international DJs in the business and is sure to fill your ears with mystical music from sundown to sunrise on the alpine stage set in the heart of the beautiful mountains of the Portes Du Soleil. It’s a 5 day music festival based in Morzine, France boasting big banging bass music!!! Come Down to the Event and you could win A 5 Day VIP Double Pass to the event + super cool hoodies and tee’s! Mix Bar are making 10 liters of punch. Buy this and go into the draw to WIN!!! DJ C:She first burst onto the Dance scene in Manchester in 2000 after a heated debate at a late night party over why most DJs had to be male. 500 quid well spent later on a dusty old pair of Technics, a barely working mixer and an hour’s lesson off a DJ pal, and DJ C:She was born and ready to prove to the world just what a determined chick with a passion for dirty baselines and pumping beats can do. With a strong background in music already she was instantly hooked, and after scoring her first gig after less than a week she was soon in hot demand. Her signature sound of Booty Bouncin’ Electro Ghetto Funk was soon born…think of a meaty but fun blend of baseline heavy Breaks and Electro, grooving vocals and Drum & Bass. DJ C:She quickly got heavily involved in Manchester’s nightclub scene playing all over the city at bars and clubs, and also through promoting her own hugely successful club nights such as ‘The Beatworx’ at the huge 3 story nightclub ‘Industry’. She was also involved with the award winning club nights ‘Tangled’ and ‘Fuse’. Together, these nights saw her playing alongside some of the decades Breaks and Drum & Bass’ elite such as The Freestylers, Freq Nasty, Andy C and DJ Hype. The journey soon grew to playing at a handful of festivals and then over to Europe rocking dance floors all over Germany, France and Switzerland. Currently based in New Zealand, C:She is still flying the flag for UK Breaks, Electro and Drum & Bass, and has been playing in both Australia and New Zealand. Set to return for a stint in Europe from December 2011, DJ C:She is back to rock the house…time to get down and dirty to some good old block rockin’ beats. See you on the dancefloor!